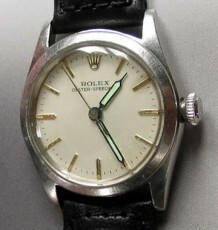 Vintage Rolex Datejust with steel case and white gold bezel. 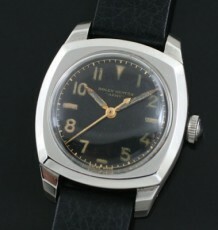 Wow what a difference between these older Vintage Rolex watches instead of the newer models with less design character. 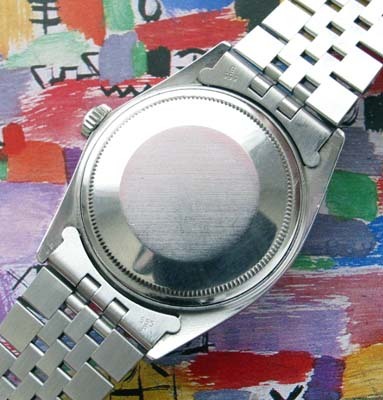 Look at the original satin silver pie pan shaped dial, with the raised Acrylic crystal. The 14 karat white gold fluted bezel makes quite a difference in comparison to the engine turned, steel bezel, found on other newer Steel model Datejusts. 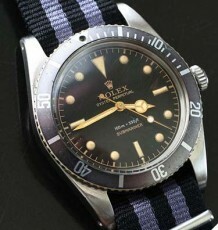 The bracelet is a recent original Rolex replacement and is in excellent condition. The all original. mint condition silver/white dial with luminous markers has the popular vintage styling cue of the the pie pan style dial with sloped edges. The watch uses the famous Rolex caliber 1570 Automatic chronometer grade movement, which is keeping excellent time. 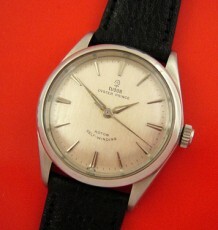 The case measures 36mm wide by 41.5mm long and is supplied on a very recent original Jubilee bracelet.